As seen on FOX News, ABC, and CNN Online, the PowerCost Monitor™ is helping thousands of people across the United States and Canada save money on their electric bill. you can see what you are spending on electricity as you spend it! Start saving on your electricity bill right away with a PowerCost Monitor™. The success of this simple, attractive device is based on the proven value of real-time feedback - helping householders save from 5% to 20% on their monthly electricity bills. in real-time, your moment-to-moment and total electricity costs in dollars and cents and in kilowatt hours. An easy to install Sensor Unit that you can simply attach to the outside of your electric utility meter. Once fastened in place, the sensor reads the amount of electricity the household is consuming in real-time and transmits the information wirelessly to the Power Monitor, located inside the home. The time, the temperature at meter location, signal strength and the battery strength of both the display and sensor units. The PowerCost Monitor ™ only shows you what your electricity is costing you. Ultimately, it is up to you to use this information to reduce your electricity bill. 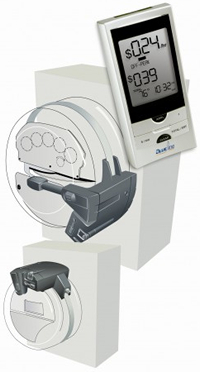 The PowerCost Monitor ™ is not a utility meter and is not intended for billing purposes. Data displayed is for informational purposes only. Due to when your meter is read by your utility and due to other utility charges, the "total" readings on your display will not exactly match what you see on your electricity bill. It is accurate within five percent of the actual amount.